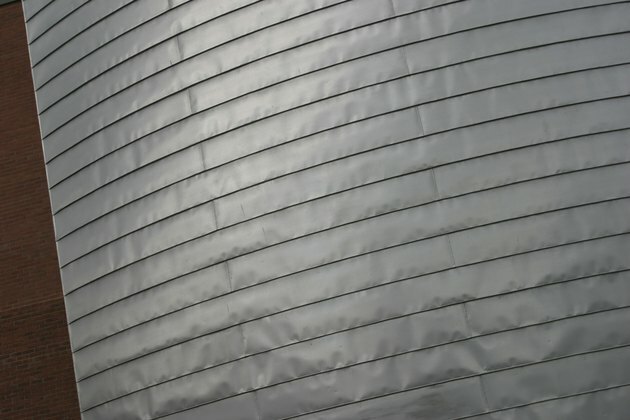 If you want to brighten the aluminum siding on your home or repaint your aluminum boat, it is not as simple as just whipping out a paintbrush and paint. Aluminum surfaces need special preparation before painting. This differs from most surfaces in that aluminum must be etched. Etching is a technique that involves coating the metal with an acid, which causes a chemical reaction that in turn produces a slight engraving. This helps paint adhere to the aluminum surface. Vinegar, a weak acid, can be used to etch aluminum in preparation for painting. Mix together a solution of equal parts water and vinegar.Coat the aluminum in the vinegar mixture and monitor it regularly, applying more vinegar solution if it begins to dry. Allow the vinegar solution to work until the aluminum surface becomes dull and darker. Wipe down the etched aluminum with warm, soapy water. Rinse it thoroughly with clean water and pat it dry with a lint-free towel. Allow the aluminum to air-dry. Apply one or two coats of aluminum primer to the etched surface with a paintbrush or small paint roller, following the manufacturer's directions. A paint roller will ensure a smoother, more even coat. If you are using a paintbrush, use long, even strokes. Allow the primer to dry. Paint the primed surface with 100 percent acrylic latex outdoor paint with the highest volume of acrylic resin as possible. Use a paintbrush or paint roller, apply one or two coats as needed, then allow the paint to dry according to the manufacturer's directions.